← London 2012 Men’s Pool A: Great Britain 3-3 Australia. London 2012, Men’s Pool B: Netherlands 3-1 Germany. The Netherlands sealed their place in the semi finals with an impressive display here against reigning champions Germany. In a fascinating game between two of the best sides in the tournament, there was plenty of skill and technical ability on display for the crowd to enjoy. Germany got off to a perfect start, grabbing the lead in the 2nd minute from a Christopher Zeller penalty corner which Jaap Stockmann got to but could not keep out. After falling behind, the Netherlands seized the initiative. Teun de Nooijer sent over a dangerous cross, but Robbert Kemperman sliding in at the far post couldn’t get a touch. 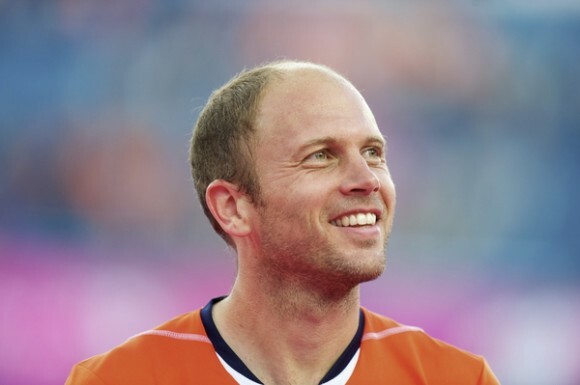 The Oranje managed to draw themselves level and it was Bob de Voogd who notched the equaliser, calmly lifting over Max Weinhold in the Germany goal after he had kept out the initial shot from the top of the D.
As the score line suggested, the game had been quite an even affair up to this point. Both sides were showing flashes of the skills they have at their disposal, but both sides were defending stoutly and keeping their rivals at bay. Moritz Furste was penalised for a heavy challenge in the 25, handing The Netherlands a penalty corner opportunity, which Roderick Weusthof blazed over the bar, ensuring the teams went into the break level at 1-1. Just a minute after half time, The Oranje took the lead. A neat one-two between Teun De Nooijer and Billy Bakker resulted in the former sliding in at the far post to guide home his 218th goal in his 450th international experience. It was a fitting way for one of the greatest ever players to mark the occasion. Five minutes later, The Netherlands won a penalty corner. Mink Van Der Weerden stepped up to score his fifth of the competition with an unstoppable drag flick high to the goalkeeper’s left. Germany began to creep back into the match, Jaap Stockmann did well to save from Florian Fuchs, sweeping up the danger with his stick, before he then made a fine save with is glove to keep his team’s two goal cushion intact. The Netherlands were being pressed further and further back into their own half, but were defending superbly. Christopher Zeller saw his penalty corner charged down before Martin Haener cleared off the line at the other end from Weusthof. Stockmann denied Fuchs once more and then made a wonderful double save from first Zeller’s drag flick and then Furste’s rebound. Germany ran out of time and the Netherlands held on for a hugely impressive win, leaving the Beijing gold medallists with work to do to ensure they qualify for the semi finals. Germany face New Zealand in their final game, knowing a point will be enough. They will take nothing for granted, however.